For additional information on the current bus services, see List of bus routes in the Bronx and List of bus routes in Queens. The Bx23 and Q50 bus routes constitute a public transit corridor running between the Pelham Bay and Co-op City neighborhoods in The Bronx, New York City, United States. 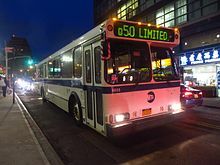 The two routes serve all of Co-op City's five numbered sections: the Q50 provides limited-stop service, and the Bx23 runs either clockwise or counterclockwise service through the neighborhood, beginning and ending at a major bus-subway connection at Pelham Bay Park. The Q50 continues south of Pelham Bay to the borough of Queens, terminating at the Flushing–Main Street subway station. Both routes are city-operated under the MTA Bus Company brand of MTA Regional Bus Operations, and are the only two local routes in the Bronx to operate under the MTA Bus brand. The two routes are the successor to the QBx1 route, privately operated by the Queens Surface Corporation until 2005, and later operated by MTA Bus. This route ran several confusing service patterns between Co-op City and Pelham Bay, with only select runs continuing to Flushing. In September 2010, the QBx1 was split into the Bx23 and Q50 to simplify service in the Bronx, and provide full-time service between Queens and the Bronx. The Bx23 constitutes a simplified version of the former QBx1 route between Pelham Bay Park and Co-op City, running either clockwise (1-2-3-4-5) or counterclockwise (5-4-3-2-1) before returning to Pelham Bay. The Q50, meanwhile, runs between Co-op City and Flushing via Pelham Bay, with its northern terminal at Erskine Place and Earhart Lane in Section 5. Q50 buses travel clockwise in Co-op City northbound, and counterclockwise southbound. The Q50 also employs limited-stop service, making fewer stops in Queens and bypassing the individual loops of Co-op City served by the Bx23. The routes run at all times except late nights; at these times, Co-op City service is replaced by the Bx28, while there is no direct Co-op City-to-Queens service. At Pelham Bay Park, both directions of Bx23 and Q50 service share three adjacent bus stops on the southbound Bruckner Boulevard to the south of the subway station. The southernmost stop at the intersection of Bruckner and Amendola Place is used by Flushing-bound Q50 service. The middle stop is used by all clockwise Co-Op City service (Q50s to Section 5 and Bx23s via 1-2-3-4-5). The northernmost stop is used by Bx23s operating the counterclockwise loop. Because of this setup, Bronx-bound Q50 buses must U-turn at Westchester Avenue to stop at Pelham Bay, then U-turn again towards Co-op City. Two former Queens Surface buses on the QBx1 under MTA operations before (left) and after (right) repainting into MTA colors. Both buses have since been retired. The QBx1 was in operation since at least the mid 1960s under the Queens Transit Corporation, labeled the "Bx1" on Queens bus maps. The route originally operated between Flushing and Pelham Bay Park. By 1968, the QBx1 was extended to Co-op City. The bus company would become Queens-Steinway Transit Corporation in 1986, and Queens Surface Corporation in 1988. On February 27, 2005, the MTA Bus Company took over the operations of the Queens Surface routes as part of the city's takeover of all the remaining privately operated bus routes. In 2009, ten buses from the Eastchester Depot near Co-op City (the former New York Bus Service depot) began to operate on QBx1 service. Two additional stops in the Bronx were added to the route in June 2010, at Baisley Avenue (southbound) and Kearny Avenue (northbound) both at Bruckner Boulevard, to connect with a pedestrian overpass to the Country Club neighborhood. Bike racks installed on a Q50 bus in Flushing in 2018. In April 1994, bike racks were installed onto QBx1 buses to carry bicycles over the Whitestone Bridge. This was the first bike-on-bus program in the city. The service was offered on a seasonal basis (April to September), with pick-up/drop-off points at 20th Avenue in Whitestone, Queens and Lafayette Avenue near Ferry Point Park in the Bronx. However, the bike-on-bus program was eliminated on February 27, 2005, the same day as the MTA takeover. In 2017, it was announced that bike racks would be installed on the fronts of Bx23 and Q50 buses by spring 2018. Each rack, mounted on the front of each bus, would be able to carry two bicycles. This was part of the MTA's ongoing pilot program to mount bike racks on several bus routes. In September 2015, the S53 and S93 routes in Staten Island had been the first routes to receive the racks. The expanded program restored bike racks on the Flushing to Co-op City bus corridor for the first time since 2005. On July 1, 2018, bike rack service was inaugurated on the Q50 and Bx23 routes. Section 1 is the northwestern section, north of Harry Truman High School. Section 2 is the northeastern section, east of Harry Truman High School. Section 3 is the western section, west of Bartow Mall Shopping Center. Section 4 is the eastern section, east of Bartow Mall Shopping Center. Section 5 is the southeastern section, east and south of the Hutchinson River Parkway. ^ "MTA Bus: Eastchester Depot Pick Glossary; Effective: 09/04/2016". MTA Bus Company. 2016. Retrieved August 7, 2016. ^ a b c d e f g h i j k l "Review of Bus Service & Performance in Co-op City with Recommendations for Service Enhancements" (PDF). Metropolitan Transportation Authority. January 2014. Retrieved December 11, 2015. ^ a b c Reyes, Lennin (November 24, 2011). "Confusing Bus Riders One Cut at a Time". The Bronx Journal. Retrieved September 26, 2015. ^ a b "MTA Bus Service Changes". Metropolitan Transportation Authority. November 2010. Archived from the original on November 25, 2010. Retrieved January 1, 2016. ^ a b c MTA Regional Bus Operations. "Bx23 bus schedule" (PDF). ^ a b c MTA Regional Bus Operations. "Q50 bus schedule" (PDF). ^ a b "Facts and Figures". mta.info. August 28, 2011. Retrieved January 19, 2016. "QBx1 Bus Timetable: Effective Fall 2009" (PDF). MTA Bus Company. 2009. Retrieved January 11, 2016. "Queens Bus Map: Notes" (PDF). archive.org. mta.info. December 2002. Archived from the original (PDF) on March 23, 2003. Retrieved July 6, 2015. "Bronx Bus Service: December 2002" (PDF). Metropolitan Transportation Authority. December 2002. Archived from the original (PDF) on March 17, 2004. Retrieved September 26, 2015. Urbitran Associates, Inc (May 2004). "NYCDOT Bus Ridership Survey and Route Analysis Final Report: Chapter 3 Transit System Characteristics" (PDF). nyc.gov. New York City Department of Transportation. pp. 72–73. Retrieved October 16, 2015. Urbitran Associates, Inc (May 2004). "NYCDOT Bus Ridership Survey and Route Analysis Final Report: Chapter 4 Operating and Financial Performance" (PDF). nyc.gov. New York City Department of Transportation. p. 9. Retrieved December 20, 2015. "Appendix B: Route Profiles" (PDF). nyc.gov. New York City Department of Transportation. p. 532. Retrieved November 8, 2015. ^ a b "MTA Bus Time: Bx23 Pelham Bay – Co-Op City". mta.info. MTA Bus Time. ^ a b "MTA Bus Time: Q50 Co-Op City/Pelham Bay – Flushing". mta.info. MTA Bus Time. ^ a b "Bronx Bus Map" (PDF). Metropolitan Transportation Authority. September 2017. Retrieved April 24, 2018. ^ "Bx23 schedule: Effective Spring 2013" (PDF). MTA Bus Company. 2013. Archived from the original (PDF) on July 21, 2013. Retrieved February 18, 2016. ^ "1975 Queens Bus Map". wardmaps.com. New York City Transit Authority. 1975. Retrieved February 18, 2016. ^ Poust, Mary Ann (December 6, 1982). "Bronx bus routes to change". Gannett Westchester Newspaper. Fultonhistory.com. Retrieved January 11, 2016. ^ Fried, Joseph P. (August 14, 1985). "STRIKE OF 4 BUS LINES DISRUPTS TRAVEL FOR THOUSANDS IN QUEENS AND BRONX". The New York Times. Retrieved January 11, 2016. ^ Roger P. Roess; Gene Sansone (August 23, 2012). The Wheels That Drove New York: A History of the New York City Transit System. Springer Science & Business Media. p. 273. ISBN 978-3-642-30484-2. ^ Silverman, Norman (July 26, 2010). "The Merger of 7 Private Bus Companies into MTA Bus" (PDF). apta.com. American Public Transportation Association, Metropolitan Transportation Authority. Archived from the original (PDF) on October 16, 2015. Retrieved October 16, 2015. ^ Woodberry, Jr., Warren (February 24, 2005). "MAJOR BUS CO. TO JOIN MTA". Daily News (New York). Retrieved January 4, 2016. ^ Boyle, Daniel; Pappas, John; Boyle, Phillip; Nelson, Bonnie; Sharfarz, David; Benn, Howard (March 2009). "Appendixes to TCRP Report 135: Controlling System Costs: Basic and Advanced Scheduling Manuals and Contemporary Issues in Transit Scheduling" (PDF). Transportation Research Board. Retrieved January 11, 2016. ^ Post Staff Report (June 3, 2010). "New bus routes should satisfy all". New York Post. Retrieved January 11, 2016. ^ "2010 NYC Transit Service Reductions – Revised" (PDF). Metropolitan Transportation Authority. March 19, 2010. Archived from the original (PDF) on February 25, 2011. ^ a b Cunningham, Jennifer H. (January 29, 2014). 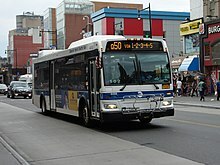 "Bus service back on track in Co-op City: MTA OK's bus service upgrades in Co-op City after slashing service in 2010". Daily News (New York). Retrieved January 11, 2016. ^ Stuttig, Bill (May 25, 2013). "Bus service restoration to be the focus of two townhall meetings set for Wednesday in Dreiser Auditorium". Co-op City Times. pp. 1, 4. Retrieved January 11, 2016. ^ "Planned Service Changes: Service adjustment in Co-op City". Metropolitan Transportation Authority. June 29, 2014. Retrieved January 11, 2016. ^ "Planned Service Changes: New Bus Stops in Co-Op City". Metropolitan Transportation Authority. 2014. Retrieved January 11, 2016. ^ "NYC Cycling Map: The Bronx, Brooklyn, Manhattan, Queens, Staten Island" (PDF). transalt.org. New York City Department of City Planning, New York City Department of Transportation, New York City Department of Parks and Recreation. 2005. Retrieved January 11, 2016. ^ "MTA will add bike racks to Bx23, Q50 buses". Bronx Home News. September 18, 2017. Retrieved September 18, 2017. ^ a b c Barone, Vin (September 18, 2017). "Bike racks coming to Bx23, Q50 buses: MTA". am New York. Retrieved September 18, 2017. ^ "Racks Available on S53, S93 Routes for 1-Year Pilot Testing Feasibility, Impact to Service". Metropolitan Transportation Authority. August 31, 2015. Retrieved March 9, 2016. ^ "MTA | Press Release | NYC Transit | MTA Running Bus Routes with New Bike Racks This Summer". www.mta.info. Retrieved July 7, 2018. This page was last edited on 1 March 2019, at 19:24 (UTC).